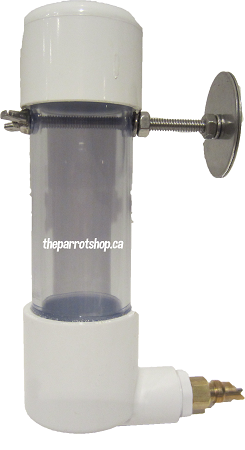 The heavy duty valve is extremely durable and recommended for quakers, senegals, pionus, ringnecks, small amazons, timneh greys, Solomon Island eclectus, and other similar-sized parrots. 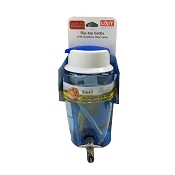 The heavy duty valve can also be used by rabbits, gerbils, and other small mammals. Our moustache parakeet loves to dip and drown her food leaving us with several mandatory daily water changes and constant worry she would get sick. After conditioning her to the Butler (she was very afraid of it at first) she is drinking from it like a pro and we love the peace we get knowing she will always have fresh water -not to mention the big time savings of not having to keep up with multiple water changes. We also love that we don't have water spills anymore when moving the cage around to clean! We'll be converting our whole flock eventually to the Butler! It is fantastic! Very pleased with our Bird Butler Easy to fix and James the Parrot loves it, took to it immediately. Thank you. Great product, well made. My green cheek figured it out within a day off putting it in his cage. This makes it much easier to ensure he has clean water now because he used to poop and dump his food it his old water bowl which we had to change 4x per day.